Mince pies and steaming tea! 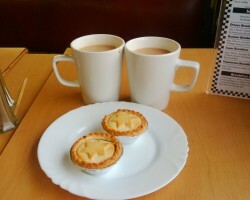 Hill’s Road Stop and partook of our first mince pies of the season (free!) with a steaming mug of tea! 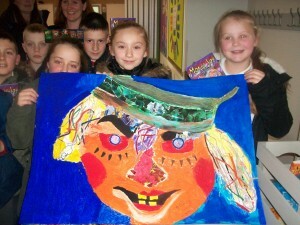 First visit was to Swinton Community School in my home town of Rotherham. Two of our nephews, Robert and Adam (likeable rogues), attended this lovely school around fifteen years ago. We performed a special presentation for the Year 7’s and ‘hit’ them with our scariest books, Bonebreaker, Scabbajack and our short story collection, Ten O’ Clock Caller. The lively and likeable audience were more than ‘up for it’ and the afternoon passed extremely quickly. 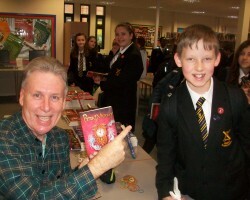 Laura Brock and the staff seemed equally ‘up for it’ and queued with the pupils the next day to get their signed copies of the books. Thank you to all of you at Swinton Community School for making our first visit so enjoyable. We hope to be back with our other books in the near future and will see you at our book launch next year on World Book Day. Second visit entailed a drive up the M1 to visit Leeds West Academy in deepest suburban Leeds! In fact the drive during the Wednesday morning rush hour was not too bad at all and we arrived well before our avid bookworms attending from six nearby feeder primary schools. My initial presentation was in the high school’s state-of-the-art theatre and was a real joy to perform in. This Mokee Joe presentation took up the whole morning followed by two successive workshops in the afternoon. Phew! A busy day for all concerned. Kathleen, from Holly Bush Primary, looked after us and Kath and I would like to thank her her for all her hard work in ensuring an enjoyable and successful day for everyone concerned. The school cluster even provided one of my books for each child and by the looks on the children’s faces during the signing it was if they had truly won the lottery! During the afternoon, the pupils created some spectacular artwork based on my spooky characters and we were more than impressed by the standard to say the least. Have a happy Christmas all of you and hope to see you again at your respective schools sometime in 2016.
received a warmer welcome from our last school of the Autumn term. 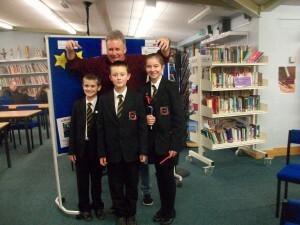 It turned out that the Headteacher’s parents were well known to us…it’s a small world, as they say! If you are reading this, Bernadette, please pass on a BIG hello to Margaret and Liam. The Deputy Head, John Drury, looked after us brilliantly and ensured the day’s events were well organised and passed without a hitch. During the morning, the Year 2’s joined in with our Mokee Joe presentation and were not phased at all…they were a real credit to themselves and the rest of the school. In the afternoon we entertained all of KS2 with our Ten O’ Clock Caller stories and had a fab time with them. It seemed rather fitting that the school was situated right beside a graveyard! For such a small school we signed an impressive number of books the next day, and once again the staff seemed as eager as the pupils to get their hands on signed copies. We are hoping to be back at St Gerard’s soon and we look forward to meeting up with them at Rotherham United’s New York Stadium on World Book Day. Speaking of World Book Day…there’s the little matter of finishing off my new book that we intend to launch on that special day – the new super-scary KRUSCHMEISTER. Better press on! Have a lovely Christmas everyone and a relaxing and restful holiday. See you all with the new book in 2016. It was with some concern and one eye on the weather forecast that we headed off to the dreaded M25 and made our way round to the South East of our island. 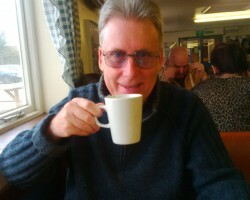 The Sunday traffic on the A12 into deepest Essex proved a relaxing and stress-free journey and we were soon settled in our accommodation on the Basildon Festival Park – conveniently close to Billericay School…old and trusted friends of ours. Mrs Clare and her library team were waiting for us on Monday morning and by ten o’ clock I was onstage in front of 300+ Year 7’s presenting Bonebreaker, Scabbajack and Ten O’ Clock Caller. As per usual, the audience got things exactly right and made my job very easy. The enthusiastic Year 7’s joined in the laughter, interacted perfectly and during my readings you couldn’t hear a pin drop! The next day we had a queue of students thronging the library eager to get their hands on the books and indulge is some festive scary reading! Pete and Tallula exchanging books. mind when he realised he was now more at the age where the Ten O’ Clock Caller might call in on him! We had a great workshop with around 30 top set Year 7 English students, focusing on the Ten O’ Clock Caller short story collection. By the end of it, the participants were eager to write scary stories of their own and that always makes everything feel so worthwhile for me. Country’ to launch my new football-themed book, Kruschmeister. Thank you Mrs Clare for being such a warm and wonderful host. We really hope your promotional film is a big hit and wish you well before our next visit. Take good care everyone! …And then it was on to TTC…Tendring Techical College…our other oldest and dearest friends down near Clacton-on-Sea, situated in the quaintly sounding village of Thorpe-le-Solken. In fact I thought it was time to explain to the TTC students that ‘Thorpe’ is an indication that the Vikings probably ransacked and took over the area in the by-gone days of the Bonebreaker. 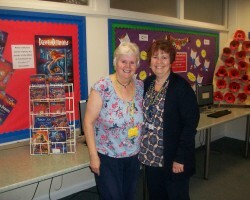 A HUGE ‘thank you’ to the lovely TTC librarian, Mrs Grosvenor – she sooooo… looked after us! 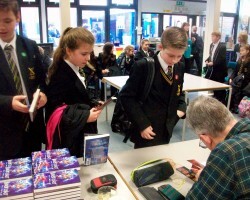 Lots of book were signed in VERY organised signings and it was a real thrill to see so many Year 8’s lined up to get their hands on the books just before we left deepest Essex – I think that was the real icing on the cake if you will forgive the well-worn cliché! Quick…it’s Friday and we must get back on the dreaded M25 before things get seriously scary….even more scary than my books!